When an online store is designed, naturally most of the effort is dedicated to homepage and product pages, while such seemingly tiny and inconsiderable element as footer is in most cases neglected and rather poorly, if not entirely overlooked. In reality, footer is a very important element, for it is the final thing your customers see as they scroll down a page, and what comes last, always leaves an impression. Therefore, the footer design must be approached with a proper amount of attention and reasoning. Yet, if your Magento 2 webstore already has a footer and you are dissatisfied with the menu it has, we offer you three ways of editing the footer menu. 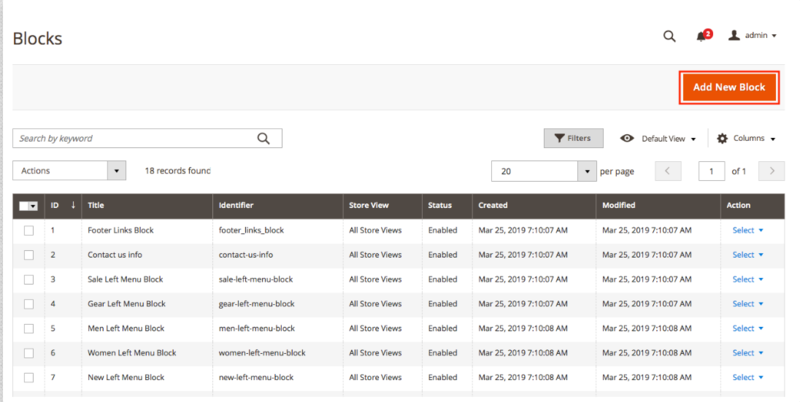 1.Log in to the admin panel of Magento 2 and navigate to Content -> Blocks. Press the Add new block button. The following menu will appear, where you need to fill in the block title and identifier you specified in the previous step (it is footer-menu in my case). 2. Next, go to Content -> Widgets to add a new widget. 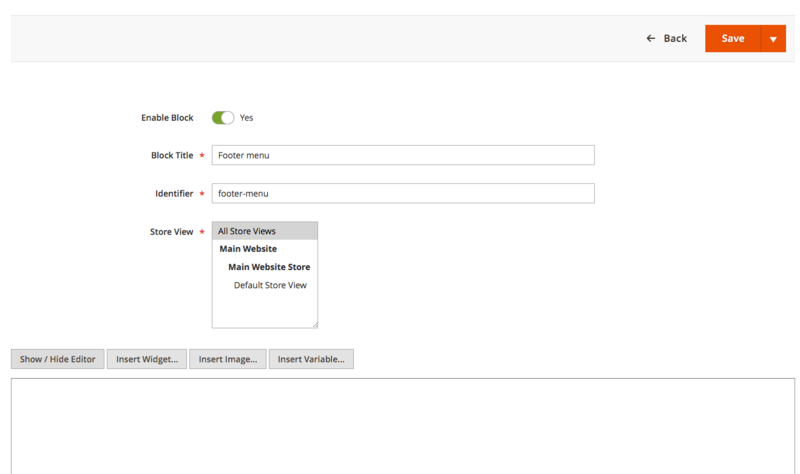 Press Add Widget, set the Type field at CMS Static Block and select your theme name at Design Theme field. When finished, press Continue. The following fields will appear; fill them in the way it is at the screenshot down below. You can learn more about widgets in Magento 2 here. Go to Widget Options tab and select the CMS block we have created. Press the Save button in the upper right corner. If the following menu appears, it means you have done everything correctly. I would advise relying on this method in case you do not need to change the whole structure of the menu, but simply add or delete a block. To edit the footer menu with layout, you need to know whether the theme is installed in app/design directory or in vendor. Go to FTP, proceed to magento folder and then to app/design folder. If the latter is empty, then you have a standard or a third-party theme installed in the vendor folder. In my case, I use Luma theme as an example (vendor/magento/theme-frontend-luma). Before you proceed to editing, create a custom theme and perform theme inheriting. this is how you create folders for our layout and templates. this is how to create a layout file through which we will add and delete menu sections. where, name is the name of the block we delete. attributes — block responsible for tag attributes. title — adds a tooltip to the link text. To establish the order, we use the block attributes after and before. If you want to completely alter the footer menu structure, the best way would be to create a separate menu template. Before we proceed, create the theme as described in method #1 and complete the steps 1 and 2.
adds our custom block with Magento_Theme::footer_menu.phtml template. <iframe> — tag to embed the map. This is how you edit a footer menu in Magento 2 three ways. I believe that every store admin will be able to find the method that would most suitable for them. If you have any questions or comments, please leave them below.